While it is true we Do NOT live by bread alone and it is true that we DO live by every word that comes from the mouth of God. The word of God says this about bread. 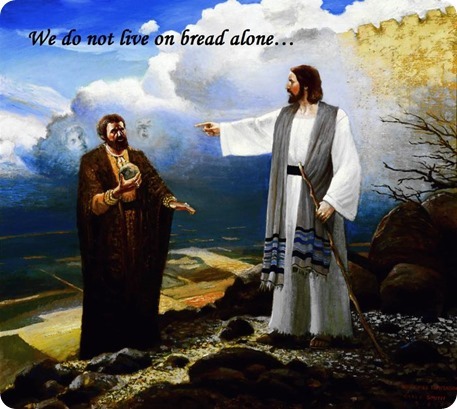 “Give us today our daily bread…” (Matthew 6:11, LEB) One of my favorite sayings goes like this: “We do not live by bread alone, but we can’t live without it either.” The devil knew Jesus was hungry. The devil knows we get hungry too. The devil used Jesus’ growling stomach against his better judgment, in order to undermine his relationship with God. The devil also uses our appetite against our better judgment in order to undermine our relationship with Jesus. When we go below the surface the devil’s confrontation with Jesus isn’t just about food it’s also about Jesus’ weakened physical condition after all he had been fasting for 40 days in a not-so-friendly-environment. The devil knows when we are hungry (not just for food) and physically exhausted like Jesus we’re vulnerable to the devils suggestions. Anticipate! Experience! Believe! Be transformed! Glory Seed Devotionals: Encouraging Words of God’s Presence in our World!